Hyderabad: The youngest state in the country, Telangana, votes today, with the foremost thought on every voter’s mind being on whether to back the pink party — the ruling Telangana Rashtra Samiti (TRS) — or give it the pink slip. This is the second assembly election in the state that was formed in 2014. The elections are being conducted in a single phase across the 119 constituencies, with nearly 2.61 crore voters eligible to get their fingers inked. There are a total of 1,821 candidates in the fray, with 32,574 polling stations across the state. The outgoing chief minister K. Chandrashekhar Rao, or KCR as he is popularly known, dissolved the state assembly on 6 September paving the way for early elections. The state was only due to go to polls in May 2019. There is speculation that the chief minister, known for his reliance on ‘divine predictions’, may have picked 6 September to make his announcement as it is considered an “auspicious date”. But it isn’t just “good luck” that led to KCR deciding on early polls. Analysts say it is a well-strategised decision made to ensure maximum political gain that can be used as leverage for the 2019 Lok Sabha elections. With votes being cast, it will soon show if KCR’s calculated risk has paid off. The TRS had appeared to be on good ground when KCR, who played a significant role in the formation of the state, announced his decision. But a Congress-led Prajakutami (people’s alliance), which includes the Telugu Desam Party (TDP), the Telangana Jana Samithi and the Communist Party of India (CPI), has made up ground. The poll fray is rounded up by the Asaduddin Owaisi-led All India Majlis-e-Ittehadul Muslimeen (AIMIM) and the BJP. 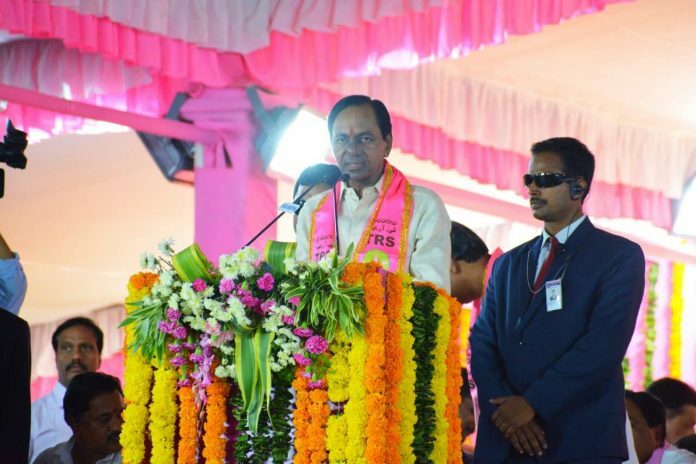 The TRS has campaigned extensively across the state on the basis of its welfare schemes and KCR’s role in the movement that led to the formation of the state. The TRS hopes to win on the back of its farmer, women and youth-centric schemes, which include the Rythu Bandhu (Farmer incentive scheme), the Shaadi Mubarak (special allowance for marriage) and uninterrupted power supply across the state. On the other hand, the Congress is hoping to use the Prajakutami to regain a lost bastion. The last government in undivided Andhra Pradesh was that of the Congress. The AIMIM is contesting in seven seats in its stronghold of Hyderabad and is absolutely confident that it will retain its numbers. But it is the Bharatiya Janata Party (BJP) that has been aggressively campaigning to make inroads and may even win a few seats. The party has ensured a systematic and well-planned election campaign similar to the one that it has conducted in the states of Madhya Pradesh, Chhattisgarh and Rajasthan. The election has been fought on two major issues: Development and corruption. The TRS has rallied behind its Bangaru Telangana (Golden Telangana) slogan, promising more welfare schemes such as providing land to the landless, two-bedroom houses for BPL families and a tap in every household. The TRS has also invoked Telangana pride at every given instance. The Congress, which has also made significant promises to improve the state, spent a substantial part of its campaign targeting the TRS over the corruption issue, claiming that the KCR family had increased its income by 400 per cent in four and a half years. It also highlighted the shortcomings of the outgoing chief minister in ensuring employment and water to the people. The TDP, which has partnered with the Congress, has looked to consolidate the Kamma votes, which are in big numbers in southern Telangana. The elections will be a big test for Chandrababu Naidu as the performance of this party will impact the TDP’s performance in the upcoming state elections in Andhra Pradesh. For the BJP, it is just another effort to make inroads in southern India. According to a survey conducted by the Association for Democratic Reforms (ADR), three major factors will be considered by the voter — the candidate, the party and the caste or religion of the candidate. While the survey does indicate that many of the legislators are facing anti-incumbency in their constituencies, there could be a swing based on who the chief ministerial candidate of each party is. This could prove beneficial to the TRS as it is the only party that has announced its CM candidate.